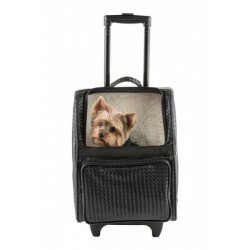 The Petote Rio Bag on wheels is a best seller! Shown here in black quilted luxe faux leather with sh..
Ivory Quilted Luxe Rio Bag On Wheels The Petote Rio Bag on wheels is a best seller! Now available in..
Our best selling Petote Rio Bag on Wheels is now available in stunning black croco embossed faux lea..
Black Woven Rio - The best selling Petote Rio Bag on wheels is now available in stylish black woven ..
Our best selling Petote Rio Bag on Wheels is now available in rich chocolate brown croco embossed fa..
RIO CLassic - Black Rolling Carrier 3 in 1 carrier! Airline Approved Carrier, Back Pack, and Car Seat!! Travel in style with the Petote Rio Bag. This best selling carrier functions as a roller bag, backp..
Travel in style with the Petote Rio Bag. Now available in khaki! This best selling carrier functio.. The Petote Rio Bag on wheels is a best seller! Shown here in our brand new orange zest color combina..